This is probably the lowest cost Short Throw Projector on the market. We will Upgrade the manufacturers warranty to on site and include the lamp for only €40 + VAT extra. 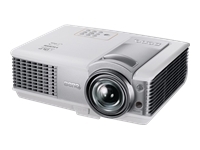 The stylish MP515 ST short throw projector is built for personal and business pleasure. With manual zoom lens, a brightness of 2500 ANSI, and two 5W speakers, both you and your family can be satisfied with crispy image bright and clean. You can not only enjoy a fun match of tennis video game with your friends, but also be able to play fair and square with sharper, more vivid images in full-screen view. Compatible with Windows 7: “Compatible with Windows 7” software and devices carry Microsofts assurance that these products have passed tests for compatibility and reliability with 32-bit and 64-bit Windows 7.